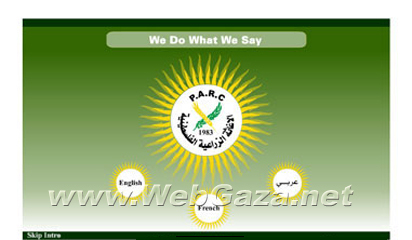 Palestinian Agricultural Relief Committees - What is PARC? The Palestinian Agricultural Relief Committees was founded in 1983 by a group of Palestinian agronomists responding voluntarily to the deterioration in agricultural extension programs in the Jordan Valley area of the West Bank as a result of the Israeli occupation by offering expert advice to marginalized, poor farmers in the area.This voluntary effort gained momentum and recognition over a short period of time, and, transformed into a non governmental organization dedicated to promoting sustainable development in rural areas in Palestine. In 1986, PARC received the first outside funding from the Welfare Association (Palestine) and, in 1987, prepared its first annual budget. PARC played an instrumental role in providing extension services to Popular Committees during the 1987 Intifada, and gained wide recognition in the process. Over the years, PARC continued to gain momentum and managed to expand its constituency to include 130 staff members and 6,476 volunteers serving some 61,950 beneficiaries.